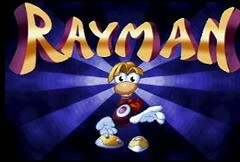 I've been a fan of Rayman almost from day one, and have acquired several games from the popular series over the years. While the sequel may still be my favorite (lots of good memories playing the beautiful 3d adventure Rayman 2 on my Dreamcast) today I’m looking at the game that started it all, the original Rayman for the Atari Jaguar. A short cute introductory tale lays groundwork for your adventure. 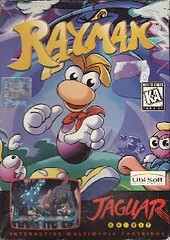 Rayman is out to rescue his captured friends from the very sinister (and generic sounding ) Mr. Dark. Very simple, but perfectly adequate as platformers don’t really need stories. Rayman is truly a beautiful looking game. It has incredibly stylish artwork, layers of parallax scrolling, generous and rich color, and the characters have wonderful animation. 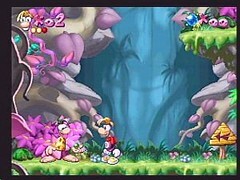 It was one of the best looking platformers of its time, and the look has aged wonderfully! In many ways, I prefer the slightly darker hues and backgrounds of the Jag version to the cotton candy pastels of the 32-bit ports. It is worth noting that since this was a multi-platform release, the audio does differ among the consoles. The Playstation and Saturn also got versions of Rayman (a 3DO version was sadly cancelled for reasons I’m not sure of) Being cd systems, they benefit from the media. (fault the decision of Atari to go w/aging cart format, not Ubisoft) The enhanced soundtrack in these versions benefits in many parts, but some parts I actually found a bit less pleasing. The cd sound effects are mixed bag. 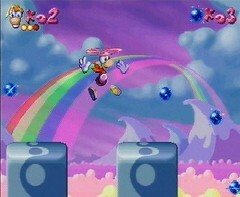 They are often good, but some (like when you hear Rayman yell at end each level) annoy me. The differences are more or less a non issue for me, and the Jag is reasonably close enough to the cd systems that comparisons will probably only be of interest to collector’s or huge fans of the series. Control is very good, despite initial misgivings. You might think that having to learn even the basic moves is a hindrance (Rayman doesn’t even have a means to defend himself at the start )but it’s not really. It actually enables you to go back through previously defeated levels and pick up optional things like extra lives (which you will most certainly need as I’ll explain shortly) and of course carry out more rescues. For those curious, I had no problems to speak of playing this game with the Jaguar controller. With its colorful levels, cute characters, and juvenile aspects (learning controls from a fairy, making friends with defeated foes, etc…) you’d think that Rayman was a game for kids that adults find enjoyable also. You’d be mistaken. 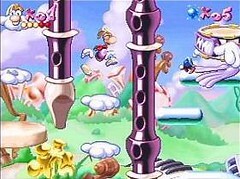 While its visuals might hold a tykes attention for a while, I can’t imagine any child playing this at length and making any real progress for the simple reason that Rayman is too darn hard! I consider myself a pretty decent gamer, but I can’t deny that the heavy challenge proves frustrating, especially in later levels (who agrees with me?) Some may welcome it as motivation to keep playing; I found it frustrating and a damper to repeated plays, especially since the challenge stems from elements that are well beneath a game that has the quality of Rayman. What I mean is this … Rayman was one of the forerunners of platformers for the 32-bit/64-bit generation consoles of the mid 90’s. So why does it adopt so many practices of platformers from the 8-bit/16-bit consoles of the late 80’s … the bad ones? Blind jumps, bottomless pits, continuously scrolling levels (both vertically and horizontally) hits that are almost unavoidable, sections where one mistake leads to instant death, enemies that regenerate as soon as you move off screen, etc … I could list even more but you get the idea. As a character, Rayman has some cute animated expressions and an innocent charm, but I’ve never found him overly interesting. He has a perpetual innocent, but vacant look, and seems rather one-dimensional. In his debut outing, he is presented as a fine character for children, but as an adult I play this game in spite of him, not because of him. That probably sounds harsher than I mean, but Rayman just doesn’t seem to have much personality (big credit to the animators for making him seem more interesting than he is) At least he did seem to flesh out a bit better as the franchise progressed. Michel Ancel, who designed (or played a role with) many of the Rayman games, was also behind a couple of other games that are special to me. One of these great games is Beyond Good and Evil. Another is King Kong, which is easily one of the best movie/game translations, and a fine game in his own right. As of this writing, it seems that the series focus is shifting back to Rayman proper and away from the Rabbids. As the series had been declining in my opinion, this is a smart move. 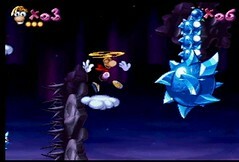 While challenging for the wrong reasons, Rayman is loaded with charm. Combined with the great audio/visual package it delivers, it is a must have. 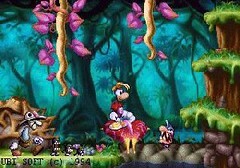 And Rayman (despite being a bit dull as a character) is an original one, and feels nothing like the mob of Sonic clones that flooded consoles in the mid 90’s. Along with Gex, Rayman launched a new series of platform games for a new generation of consoles and (for that period) is definitely among the better of its kind. Last edited by Trev on Sat Nov 03, 2012 3:31 pm, edited 2 times in total. My cart requires you to turn the music on. It's set to off by default! 3DO Experience wrote: My cart requires you to turn the music on. It's set to off by default! The only way mine can't play music is by hitting 0 on the # pad. That's a great write up. I love Rayman especially on the Jag. Many people point at the PS1 version, but I have that, and for me it will always be the Jaguar version. That's a great write up. 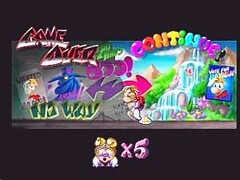 3DOKid wrote: I love Rayman especially on the Jag. Many people point at the PS1 version, but I have that, and for me it will always be the Jaguar version. Last edited by Trev on Wed Jul 06, 2011 10:39 pm, edited 1 time in total. That's how I have to turn mine on. Maybe they had a bad first batch or something happened to the cart. My jag music is on by default. I just checked. There is no escaping the fact that it's better on the Jag than any port. I suppose they tuned the game to jag controller, and the graphics are sharper. The jag naturally seems to smooth the graphics in the distance and it gives this game and pitfall a luxurious feel it's awesome. 3DOKid wrote: The jag naturally seems to smooth the graphics in the distance and it gives this game and pitfall a luxurious feel it's awesome. Pitfall ... now that is a game I haven't spent enough time with. I should go play if for a bit right now. Jaguar cartridges save preferences to sound on/off volume, etc. To reset your cartridge to default (music on) press the pause and # and * keys at the same time. Pressing pause during gameplay should allow you to access volume and other stuff by pressing the a. b and c buttons while paused.